Last week I had the good luck to attend a preview of the V&A’s latest blockbuster exhibition, David Bowie is, an entertaining retrospective of Bowie’s career to date. The exhibition opens with the somewhat grey backdrop of pre-Bowie 60s rock and roll, before exploding into glorious technicolour, charting the star’s influences, rise to fame and enduring success. While comparisons to Andy Warhol might be slightly overreaching, it is abundantly clear how important Bowie’s influence has been in setting the template for modern music stardom. Collaborating with avant-garde producers, artists and fashion designers (the Kansai Yamamoto outfits on show are some of the exhibition’s highlights), Bowie set a groundbreaking and persistent trend by manipulating his public image and creating off-the-wall alter-egos to capture the imagination of the record-buying public. But it is Bowie’s music that takes centre stage here. The audio headsets designed for the exhibition cleverly sense the visitor’s location and play music and interview clips to compliment and explain the visual exhibits. 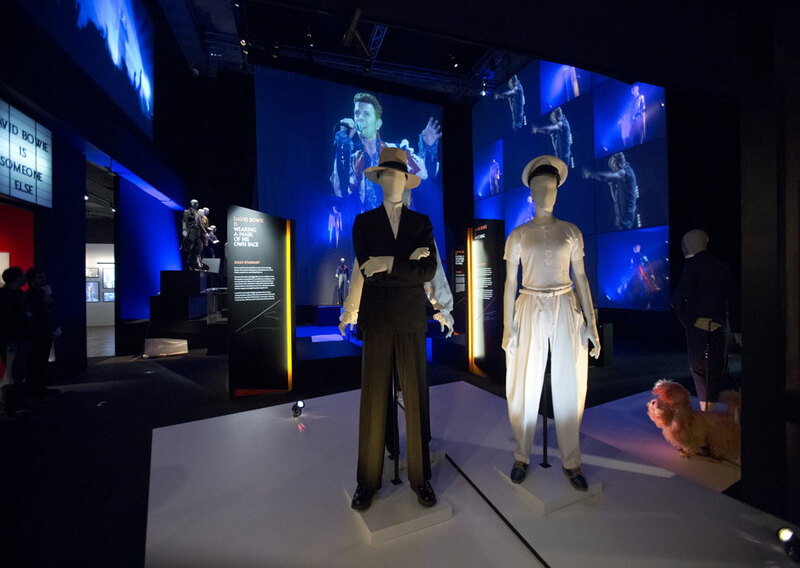 The largest section of the show, with huge, floor-to-ceiling screens and accompanying audio, features some of Bowie’s iconic stage performances and successfully conjures up some of the energy of a live venue. The exhibition is one of London’s most hotly anticipated openings of the year and, unsurprisingly, has proven extremely popular (catch tickets if you can – the show is all but sold out for its entire run). The exhibition is open until 11 August.